Ewing's sarcoma was first described by James Ewing in 1921, which is a primary malignant neoplasm of the skeletal system. It is now thought to arise from immature reticulum cells or primitive mesenchymal cells of the bone marrow. It is a rare malignancy that generally occurs in childhood. This tumor affects pelvic girdle and the long bones of the lower extremities commonly. 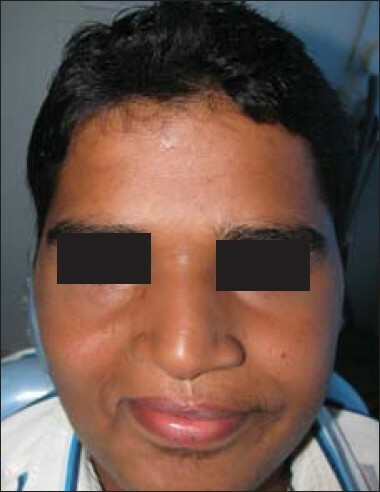 A 12-year-old male patient reported with a complaint of swelling since 4 months [Figure 1] and pain for the past 1 month on the right side of the face. Swelling was of slow onset and progressive. Over a period of 4 months, the entire left side of the midface was involved resulting in moderate decrease in the right nasal airway competence and slight reduction in the right eye opening. There were no significant systemic problems noted. No significant disorders found on general physical examination. There was a well-circumscribed swelling measuring 9 × 6 cm present on the right cheek. There was restricted eye opening with decreased palpebral fissure width with mild proptosis. Visual acuity was present at 1 ft range with normal eye movements. Intraorally, reddish pink, non-ulcerated, well-circumscribed swelling was present in relation to the right upper cuspid to maxillary tuberosity obliterating the right maxillary vestibule. On palpation, swelling was tender, lobulated, nonfluctuent, bony hard in consistency, nonpulsatile, and noncompressible. There was grade-II mobility of teeth from canine to second molar in the right quadrant. Hematologic and biochemical tests were found to be within normal limits. An OPG showed a mixed radiolucent and radioopaque lesion involving the maxilla and nasal cavity. Septal deviation with lateral nasal wall erosion, opacification of right maxillary sinus, and loss of lamina dura with displacement of roots of few teeth of the affected quadrant were also noted. An expansile soft tissue density mass lesion of 64 HV enhancing up to 70 HV was seen in right maxillary sinus with expansion of the wall with thinned-out and eroded bony margins. Posterolateral and anterolateral walls of right maxillary sinus showed cortical break and extension into the infratemporal, temporal, buccal, and facial tissues. Cortical breach was observed in the superior and medial walls of the sinus. Overall, the radiographic findings were suggestive of a malignant tumor of maxillary bone. Sections were stained using Hematoxylline and Eosin (H&E), PerAcidSchiff (PAS), and reticulin stains. Solid sheets and masses of small round cells with scanty stroma were seen in H & E sections. Few connective tissue septa were seen intervening among the tumor cells. The cells appeared with faint cytoplasmic membrane with large hyperchromatic nuclei. Cytoplasm was seen to be scanty. In selected foci, typically the tumor cells were arranged in rosettes perivascularly. Infrequent mitotic figures were also observed. Significant necrotic areas were also seen. PAS sections were positive for intracytoplasmic glycogen content. Reticulin was positive around vessels and in collagenous septa. The typical histologic appearance with the presence of PAS-positive glycogen and the absence of any tumor osteoid was conclusive to diagnose this tumor as Ewing's sarcoma. Extended maxillectomy was performed including hard palate till midline and a part of soft palate, lateral nasal wall. Floor of orbit was preserved. Recovery was uneventful [Figure 2]. Three weeks postoperatively, the patient was subjected to chemotherapy. 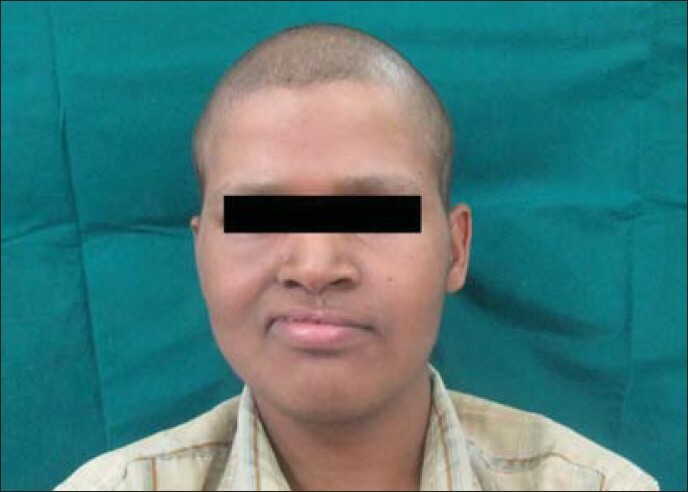 Rehabilitation was done later with prosthetic obturator, [Figure 3] and reasonable facial harmony was achieved. The followup of this case for the past 1 year revealed no recurrence till date [Figure 4]. Histopathologically, this tumor needs differentiation from other small, round cell tumors, including small cell osteosarcoma and malignant neoplasms, such as mesenchymal chondrosarcoma, rhabdomyosarcoma, malignant lymphoma, eosinophilic granuloma, neuroectodermal tumors, and metastatic neuroblastoma. Eosinophilic granuloma, malignant lymphoma, and metastatic neuroblastoma are mistaken histologically for Ewing's sarcoma. Eosinophilic granuloma can be distinguished because of the presence of "histiocytic" features, that is, abundant, indistinct eosinophilic cytoplasm with oval or indented nucleus. Multinucleated cells may be present. Malignant lymphoma contains lymphoid cells, intermixed with round cell components of varying size and cytoplasmic contents. The nuclei of these cells are round or oval with a distinct nuclear membrane, which is sometimes smooth or cleaved. Reticulin stain is often positive, whereas the PAS stain is usually negative. Ewing's sarcoma is a rarer malignancy that may affect the facial bones of young individuals. In the isolated area of Ewing's sarcoma too, the risk of metastasis is substantial. It strongly suggests for multiple therapy modalities. In case of suspected cases, an evaluation of the lesion should be carried out using plain films, CTs, MRIs, bone scan, and biopsy. After treatment, it is a must to provide suitable prosthesis, to ensure the quality of life of these young patients. 1. Berk R, Heller A, Heller D, Schwartz S, Klein EA. 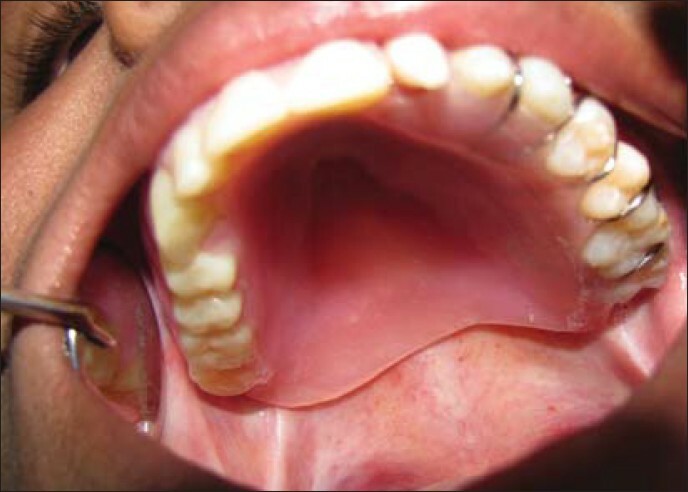 Ewing's sarcoma of the mandible: A case report. Oral Surg Oral Med Oral Pathol Oral Radiol Endod 1995;79:159-62. 2. Arafat A, Ellis GL, Adrian JC. Ewing's sarcoma of the jaws. Oral Surg Oral Med Oral Pathol 1983;55:589-96. 3. McCormack LJ, Dockerty MB, Ghormley RH. Ewing's sarcoma. Cancer 1952;5:85-99. 4. Wilmer D. Radiology of Bone tumors and allied disorders. W.B. Saunders: Philadelphia; 1982. p. 2251. 5. Pindborg JJ, Hjorting-Hansen. Atlas of diseases of the jaws. W.B. Saunders: Philadelphia; 1974. p. 36. 6. Worth HM. Principles and practice of oral radiology interpretation. Year Book Medical Publishers: Chicago; 1963. p. 580-1. 7. Wood RE, Nortje CJ, Hesseling P, Grotepass F. Ewing's tumor of the jaw. Oral Surg Oral Med Oral Pathol 1990;69:120-7. 8. Angervall L, Enzinger FM. Extra skeletal neoplasm resembling Ewing's sarcoma. Cancer 1975;36:240-51. 9. Bacchini P, Marchetti C, Mancini L, Present D, Bertoni F, Stea G. Ewing's sarcoma of the mandible and maxilla. Oral Surg Oral Med Oral Pathol 1986;61:278-83. 10. Fielding AF, Lindemeyer R, Harris JW, Hartman MJ. Ewing's sarcoma of the mandible: A combined approach to treatment. J Clin Pediatr Dent 2002;26:409-12. 11. Hustu HO, Holton C, James D Jr, Pinkel D. Treatment of Ewing's sarcoma with concurrent radiotherapy and chemotherapy. J Pediatr 1968;73:249-51.